In the second method, we use a small sieve and fill small areas at a time. I have found the second method to be much better. This is because even as a kid I was never good at drawing! 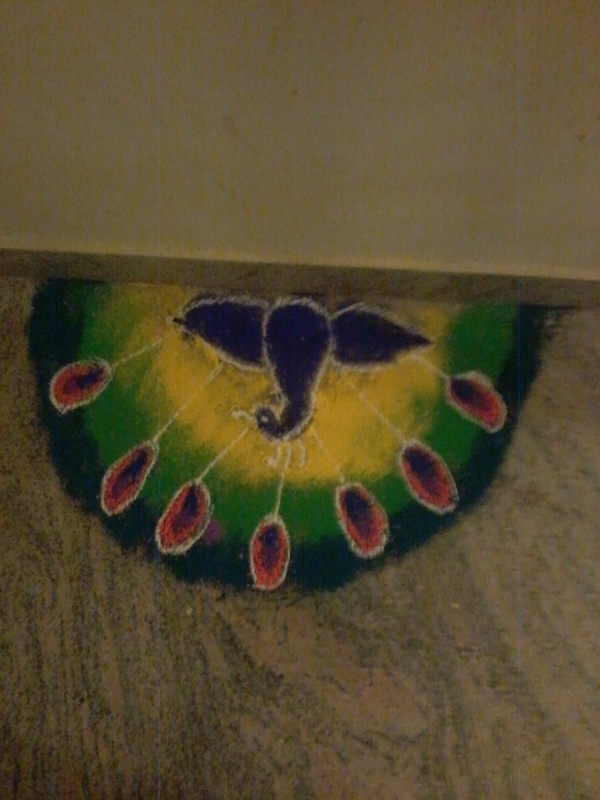 So the very first outcome of a colour rangoli using this method got me inspired. 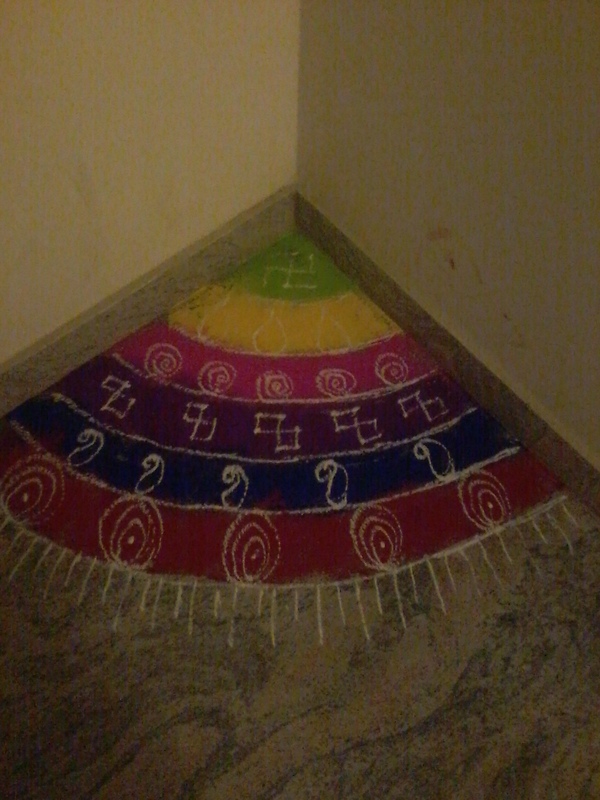 Here’s my first attempt at a colour rangoli (I drew the lines first and filled the colours by dropping them with my fingers). You can see that the finish isn’t great. 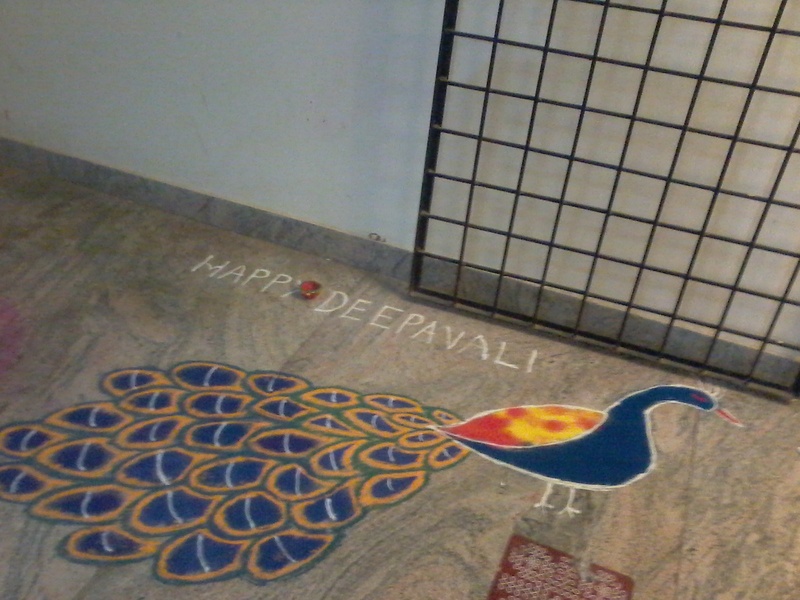 But this one took me a little more than 2 hours. So, I felt I have to somehow tweak the process so that it can be done faster. And I knew there was a method using the filter. But I had to try it to really understand how it works. You can see the result. 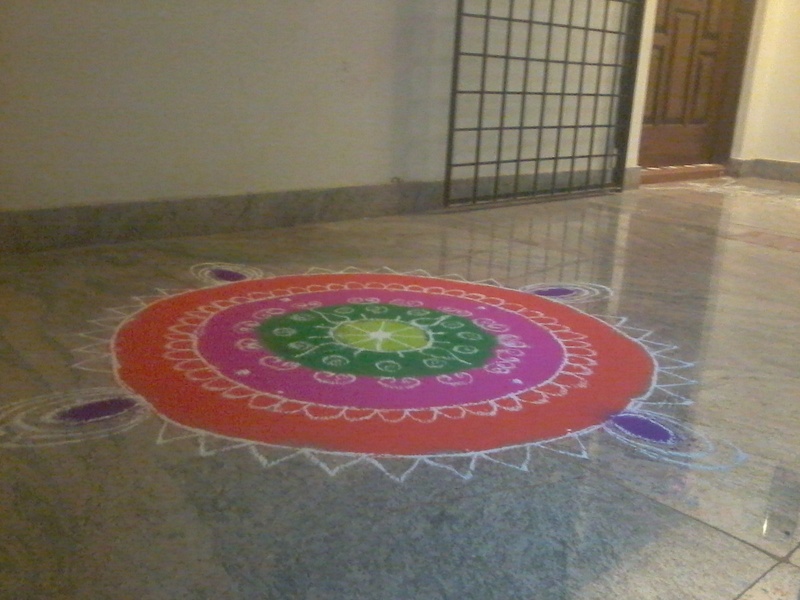 The colours are bright because I didn’t have to add marble (white) powder to make it droppable and hence the finish is much better. So here’s the process I followed. Start with a design which is easy. Draw an outline with a chalk. Starting with one small area at a time, fill the colours using the tea filter. Note that any extra powders on it sides can either be cleared with the cloth rag or can be merged with the next colour for a beautiful effect. 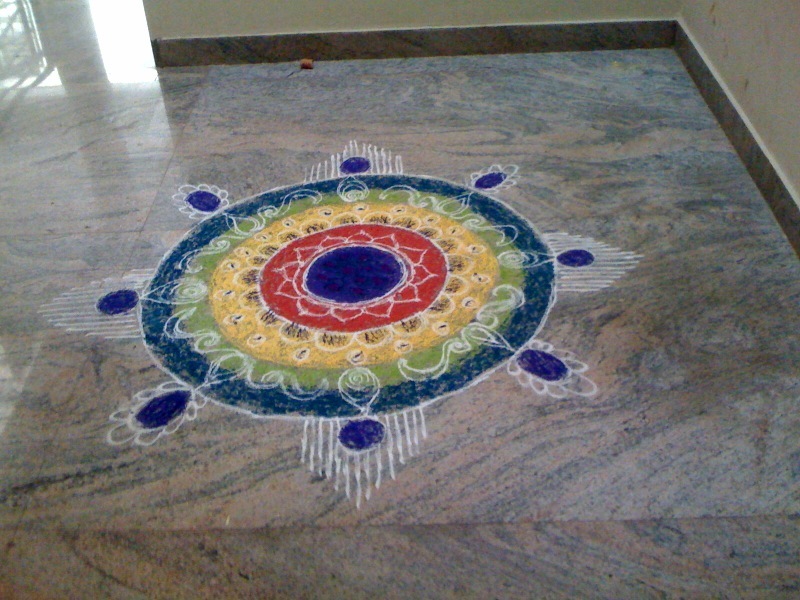 After filling one portion, draw free hand designs over it using the marble (white) powder. Ensure your hand doesn’t touch the floor while doing this. 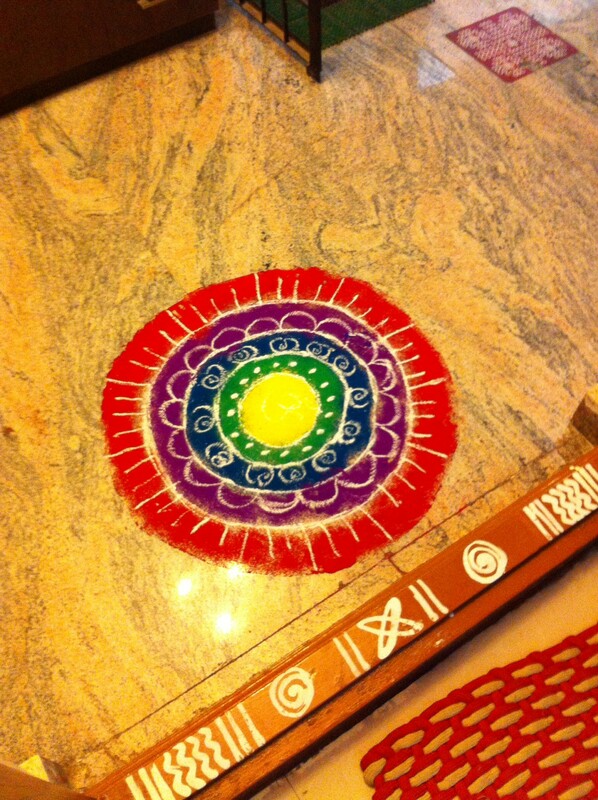 You can make the rangoli as big as you want. I take 30 to 45 minutes for a decent sized one. Just try and enjoy the “wow” feeling once you finish it.